in ainm an Athar agus an Mhic agus an Spioraid Naoimh. Áiméan. Ar ndóigh is ceart dúinn comhartha na Croise a ghearradh orainn féin le linn dúinn na focail sin a rá. Déantar a leithéid ag gabháil thar shéipéal nó nuair a chastar cróchar nó otharcharr orainn. Is ceart an comhartha a ghearradh orainn féin go minic agus an phaidir a rá go minic mar is cosaint iontach Comhartha na Croise in aghaidh an oilc. Is minic a deir muintir na Gaeltachta ‘an Chroich Chéasta orainn’ nuair a scanraítear iad. Is focal níos sine ná cros an focal croich a chiallaíos an rud céanna. A Dhia, beannaigh an bia seo a thug tú dúinn as ucht do rathúnais trí Chríost ár dTiarna. Áiméan. A Dhia, gabhaimid buíochas leat as ucht an bhia a thug tú dúinn as ucht do rathúnais trí Chríost ár dTiarna. Áiméan. Abair na paidreacha seo am ar bith a n-itheann tú. Nuair a óltar deoch nó nuair a itear béile le daoine ar ócáidí speisialta is ceart an ghuí seo a leanas a rá: Go mbeirimid beo ar an am seo arís. Agus is é an freagra: Áiméan. Is ó pater (‘athair’) na Laidine a tháinig an focal paidir chugainn agus is é Íosa Críost a mhúin ‘Paidir an Tiarna’ dúinn. Is iomaí cineál paidre ann. Is paidir a deirtear i bpáirt le daoine eile go hiondúil ‘an Paidrín (Páirteach nó an Choróin Mhuire)’. Paidrín a thugaimid freisin ar an slabhra le clocha beaga air a úsáidtear le cuntas a choinneáil ar phaidreacha an Phaidrín Pháirtigh. Is é guí an focal dúchasach. ‘Iarratas nó impí’ an chiall bhunúsach a bhí leis an bhfocal seo. Tá cruth spéisiúil ar Phaidir an Tiarna: Adhradh atá sa gcéad leath agus is iarratas atá sa dara leath. Bímis ag guí agus ag paidreoireacht! Ó bhás codlata na hoíche. Ár nAthar Naofa an Pápa. 1 Is mise an Tiarna do Dhia; ná bíodh déithe bréige agat i mo láthairse. 2 Ná luaigh ainm an Tiarna do Dhia, le mí-úsáid a bhaint as. 3 Cuimhnigh ar an tSabóid agus coinnigh naofa í. 4 Tabhair onóir do d’athair agus do do mháthair. 8 Ná tabhair fianaise bhréige in aghaidh do chomharsan. 9 Na santaigh bean do chomharsan. 10 Ná santaigh cuid do chomharsan. Dúirt Íosa Críost féin linn go gcomhlíonfaimis na haitheanta seo ach (1) grá a thabhairt do Dhia; agus (2) grá a thabhairt dár gcomharsa. Is iomaí bealach a gcuireann daoine a gcreideamh in iúl. Gearrann daoine Comhartha na Croise orthu féin agus iad ag gabháil thar shéipéal nó nuair a chastar otharcharr nó cróchar orthu. Caitheann daoine áirithe biorrán an Réadóra nó cros nó bonn míorúilteach nó scaball. Bíonn paidrín ar crochadh ina gcuid carranna ag daoine eile. Bíonn crosa, pictiúir agus dealbha beannaithe ag maisiú an tí ag daoine eile agus bíonn cóip den Bhíobla agus de leabhair agus d’irisí cráifreacha timpeall an tí acu. Luann roinnt daoine Dia go minic ina gcuid comhrá agus freastalaíonn siad ar sheirbhísí reiligiúnacha go féiltiúil. Is cinnte go dtugann na comharthaí seo misneach dá lán. An bhfuil cóip den Bhíobla Naofa agat? Mura bhfuil, ceannaigh cóip agus cuir romhat é a léamh ó thus go deireadh. Tá 1268 leathanach sa mion-eagrán Gaeilge den Bhíobla. Dá léifeá leathanach amháin sa lá bheadh sé léite agat faoi cheann trí bliana go leith. Ar ndóigh dá léifeá ceithre leathanach sa lá ní thógfádh sé bliain féin ort! Nár dheas an rud Briathar Dé a léamh ó thus go deireadh ar a laghad uair amháin i gcaitheamh do shaoil? (Tá neart léitheoireachta spioradálta eile as Gaeilge le fáil ó Fhoilseacháin Ábhair Spioradálta.) Tabhair faoi agus beidh Dia leat. Is mór is fiú léamh faoi dhaoine a thiomnaigh a saol do Dhia agus a thug grá dá gcomharsa. Dhá leabhar is fiú a léamh go mór: Éadáil Ní Chuinn agus Frank Duff Proinsias Ó Duibhh leis an Athair Séamas de Vál. Ba é Proinsias bunaitheoir Léigiún Mhuire agus ba bhall díograiseach den eagras céanna Éadáil a thug a saol ar son daoine eile in Éirinn agus thar lear san Afraic. Téann daonnacht agus acmhainn grinn na beirte seo i gcion ar an léitheoir. Agus ar ndóigh téann díograis, ceannródaíocht agus smaointe nuálacha na beirte i gcion go mór ar an léitheoir. Is bocht an scéal a laghad eolais atá ag muintir na hÉireann trí chéile ar an mbeirt ghaiscíoch seo. Cuir thú féin ar an eolas fúthu. Léigh na leabhair. B’iontach an duine Karol Wojtyła (Eoin Pól II) agus is iontach an duine Joseph Ratzinger (Beinidict XVI). Is mór is fiú eolas a chur ar shaol agus ar shaothar na beirte seo a d’oibrigh chomh díograiseach ar son na hEaglaise astu féin ar dtús agus i bpáirt le chéile ar feadh blianta fada. Tá dírbheathaisnéisí go leor scríofa faoi Eoin Pól II. Is é an saothar fíorchumasach Witness to Hope le Geroge Weigel an ceann is fearr. Is é Pope Benedict XVI: A Biography of Joseph Ratzinger le John L. Allen an ceann is fearr go dtí seo ar an bPápa Beinidict. XVI. Ábhar léitheoireachta i gcomhair d’anama. Foilsíodh Caiticiosma na hEaglaise Caitlicí in 2001. Tá cuntas cuimsitheach i nGaeilge ar chreideamh na hEaglaise Caitlicí sa leabhar fíor-thábhachtach seo. Tá an Caiticiosma roinnte ina cheithre chuid: Admháil an Chreidimh, Ceiliúradh na Rúndiamhra Críostaí, An Bheatha i gCríost, An Urnaí Chríostaí. Tá dualgas orainn a oiread eolais agus is féidir a chur ar an gcreideamh agus an t-eolas sin a roinnt ar dhaoine eile. Ba mhaith an smaoineamh an Caiticiosma a léamh agus an t-eolas a roinnt ar ár gclann, ár ngaolta, ár gcairde agus ar strainséirí. B’fhiú sliocht a léamh go príobháideach nó le linn phaidreacha an teaghlaigh nó ceangal le grúpa staidéir ar an gCaiticiosma. Is é Séipéal Eoin Baiste an séipéal is seanbhunaithe de na trí shéipéal Chaitliceacha i gCluain Tarbh. Séipéal Naomh Gaibréal an séipéal is mó acu agus is é Séipéal Naomh Antaine an ceann is nua-aimseartha. Tá atmaisféar dá chuid féin ag gach uile shéipéal acu. Airímid dílseacht ar leith dár séipéal féin. Mar sin féin is fiú blaiseadh d’atmaisféar na séipéal eile ó am go ham agus aithne a chur ar pharóisteánaigh uile Chluain Tarbh. Tagann cléir na dtrí shéipéal chugainn le haghaidh Shearmanas an Athmhuintearais le linn na Seachtaine Móire ar ndóigh. Is cinnte gurbh fhiú ócáidí eile a bheith ar siúl againn i bpáirt le chéile. (NÓ ar feadh na hoíche). is ná lig do diabhal mé a chur amú. Is fiú an phaidir seo a rá ar maidin agus san oíche agus am ar bith a mbíonn faitíos orainn nó a n-airímid cathú orainn olc a dhéanamh. Tá comhluadar Anglacánach, comhluadar Preispitéireach agus comhluadar Modhach anseo i gCluain Tarbh. Tagaimidne Caitlicigh le chéile leo babhta sa mbliain le linn Sheachtain na hAontachta Críostaí. Ar ndóigh tá baill na gcomhluadar céanna sin agus baill de chuid na hEaglaise seo againne rannpháirteach in Amhránaithe Ghort na Mara. Is iontach an obair a dhéanas an cór céanna ar son an éacúiméineachais i gCluain Tarbh agus níos faide as láthair. Bíonn Hiondúigh ag freastal ar shearmanais sa séipéal seo againe ó am go chéile. Seans go bhfuil Moslamaighh agus Giúdaigh ag cónaí sa bparóiste freisin. Ba mhór an grá dia lámh an chairdis a shíneadh chuig na pobail sin. Bhí grúpa as an bparóiste ar oilithreacht go dtí an Talamh Naofa le deireanas. B’iontach go deo an rud cuairt a thabhairt ar na láthairecha tábhachtacha ar fud Iosrael agus na Pailistíne a bhaineas le saol agus le ministreacht phoiblí Chríost. B’iontach an oscailt súl díograis reiligiúnach na nGiúdach agus na Moslamach a thabhairt faoi deara freisin. Ba é an rud ba thruamhéalaí ar ndóigh a fháil amach faoi laghad na gCríostaithe Iosraelacha / Palaistineacha. Níos lú na 2.3% faoin gcéad den phobal. Tá an imirce tar éis líon na gCríostaithe a laghdú go mór le blianta beaga anuas. Nior mhiste guí ar son neartú na Críostaíochta sa Talamh Naofa. as ucht muid a thabhairt le chéile. agus bíodh muinín againn asat i gcónaí. de chomhuain is a mhairfeas muid beo. Is éard é paróisteánach ‘duine a chónaíos i bparóiste.’ Is ceantar riaracháin eaglasta lena shéipéal agus lena chléir féin an paróiste. Is ón Laidin parochia a shíolraigh ón nGréigis paroikia (‘ag cónaí go sealadach’) a tháinig an focal ‘paróiste’ chugainn. Ciallaíonn para ‘fo-‘ agus ciallaíonn oikas ‘áitreabh nó áit chónaithe’. Mar sin is féidir linn a rá gurb é an paróiste an áit chónaithe shealadach atá againne paróisteánaigh. Na flaithis an cónaí buan a bheas again le cúnamh Dé. Cuirimis aithne ar a chéile sa séipéal agus tugaimis cúnamh dá chéíle. Feiceadh daoine eile an grá atá againn dá chéile agus tuigimis féin gur ar scáth chéile a mhairimid. Is minic a chastar daoine strainséartha orainn ar an tsráid nó i suímh eile a dtugaimid taitneamh dóibh nó a mbímid diúltach ina leith ar údar éigin. Is maith is fiú guí ar son na ndaoine céanna sin. Más daoine taitneamhacha iad is ceart buíochas a ghabháil le Dia as ucht an méid sin. Más daoine contrártha iad, dar linne, ní miste guí ar a son go dtuga Dia cúnamh dóibh. Ní miste cuimhneamh air gur cruthaíodh an uile dhuine i gcosúlacht Dé agus nuair a bhreathnaímid ar dhuine eile go mbreathnaímid ar ghné de chosúlacht Dé. Is comharsa an strainséir agus tá dualgas orainn grá a thabhairt dár gcomharsa. Is iomaí duine ar mhaith leis maratón a rith. Sin 26.2 míle nó 42 ciliméadar. Is féidir le duine ar bith atá ina shláinte tabhairt faoi taobh istigh de leathbhliain. Ní mór bunsraith 40 míle reatha sa tseachtain a leagan síos ar feadh míosa. Ansin ní mór 16 seachtainí ag rith achar fada: 8 míle sa lá ar a laghad ceithre lá sa tseachtain agus rith fada 12 nó 14 nó 16 nó 18 nó 20 nó 22/23 míle (ar a mhéad) lá amháin sa tseachtain. Tá an naofacht amhlaidh. Tosaigh go beag agus méadaigh an iarracht ar ghuí agus ar dhea-oibreacha lá i ndiaidh lae. Bíonn teagmhálacha fánacha againn gach uile lá le gaolta, le lucht aitheantais agus le strainséirí. Is ceart dúinn gach uile dheis acu seo a thapú leis an naofacht a chothú ionainn féin agus sna daoine eile sin. Is féidir tosú le dea-aoibh a chur orainn féin ina láthair. Ní miste focal dearfach a rá leo. Níl aon údar nach luafaimis Dia sa gcomhrá agus nach nguífimis beannacht Dé orthu. Tugaimis dea-shampla dóibh inár n-iompar agus inár gcomhrá. Féachaimis le hualach na beatha orthu a laghdú. Feicimis cosúlacht Dé iontu agus b’fhéidir le Dia go bhfeicfidís sin cosúlacht Dé ionainne. Cad chuige a n-éistfeadh duine ar bith le mo chomhairle-se? Ní as ucht nach ndearna mé aon cheo as bealach riamh go háirithe é. Is iomaí rud as bealach a rinne mé agus.a dhéanaim i gcónaí. Go bhfóire Dia orm. Ar ndóigh bíonn caitheamh ina dhiaidh agam nuair a dhéanaim drochrud. Ar an lámh eile, ní bhíonn caitheamh ina dhiaidh ar bith agam faoi na rudaí maithe a dhéanaim. ‘Más féidir leat beart ar fónamh a dhéanamh do dhuine, déan é, ach ná déan drochbheart ar aon duine go deo.’ Sin é a deireadh m’athair linn. Beannacht Dé lena anam. Ba mhaith an chomhairle í go deimhin. A Thiarna, labhair tú leis na ciníocha ina dteangacha dílse féin Domhnach Cincíse. Labhair tú fós le muintir na hÉireann ina dteanga féin trí Phádraig, Bhríd, Cholm Cille agus naoimh uile ár dtíre. Soilsigh ár n-aigne chun urraim a thabhairt don oidhreacht uasal a tháinig chugainn tríd an teanga sin, agus neartiagh ár dtoil chun í a shlánú agus a láidriú chun do ghlóire féin agus onóir na hÉireann, trí Chríost ár dTiarna. Cruthaíodh an uile dhuine i gcosúlacht Dé. Is ceart dúinn grá a thabhairt do Dhia, dúinn féin agus don uile dhuine. Sin rud nach furasta a dhéanamh. Cuirim i gcás, is deacair grá a thabhairt don té a ghortaíos go fisiciúil nó go síceolaíoch nó go spioradálta muid. Céard é sampla Chríost? Thug Seisean grá dóibh siúd a chur chun báis é. Is ionann grá a thabhairt do dhuine agus leas an duine sin a bheith ar d’aire; a bheith ar mhaithe leis – ar nós mar is cás linn ár leas féin, is cóir gur cás linn leas an uile dhuine. Is mothú diúltach an ghráin a ídíos ár gcuid fuinnimh. Is í malairt ghlan an ghrá í. Is eol dúinn a oiread agus atá call againn féin le trócaire Dé lenár gcuid peacaí a mhaitheamh. Creidimid nach bhfuil peaca dá mhéad nach maithfidh Dia dúinn ach caitheamh ina dhiaidh a bheith againn ina thaobh. Cad chuige mar sin nach mbíonn trua againn dóibh siúd a dhéanas dochar dúinne i leaba gráin a bheith again orthu? Cad chuige nach nguímid ar a son go dtiocfaidh siad ar mhalairt iompair agus go nochtfaidh siad grá do Dhia, dúinne agus don uile dhuine? Ceapaimid uile go bhfuil tábhacht ag baint leis an obair a dhéanas muid. Tá an t-ádh ar dhaoine a íoctar as ucht obair a dhéanamh a thaitníos leo. Ach ar ndóigh bíonn cúraimí eile ar dhaoine i dteannta chúram na hoibre. Bíonn orainn freastal ar ár muintir, ar ár dteaghlach, ar ár gcomharsana, agus ar strainséirí freisin. Uaireanta is i lár na hoibre is ea a tharraingítear de leataobh muid agus a bhuailtear cúram gan choinne orainn. Is minic linn a bheith míshásta nuair a tharlaíos a leithéid. Má thuigimid gur glaoch chun seirbhíse an Chríostaíocht, tuigfimid gur bealach chun na naofachta a leithéid. An bhfuil rudaí ba mhaith leat a fheiceáil ag tarlú i bParóiste Eoin Baiste nach bhfuil ag tarlú faoi láthair? 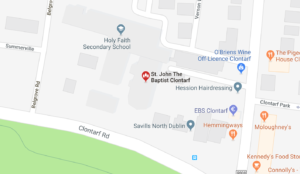 An bhfuil rudaí ar siúl sa bParóiste arbh fhéidir feabhas a chur orthu? An bhfuil aithne agat ar dhaoine nach bhfuil gníomhach in obair an Pharóiste ach a d’fhéadfadh rud éigin fiúntach a dhéanamh? An bhfuil aon rud ar siúl agat féin ar son an Pharóiste? Nárbh fhiú ugach a thabhairt do dhaoine eile páirt a ghlacadh in obair an Pharóiste? Nárbh fhiú duit féin rud éigin a dhéanamh ar son an Pharóiste? Ná fan go n-iarrtar ort é. Déan tairiscint. Glacfar léi le fonn! Is peacach gach uile dhuine. Tá an claonadh chun oilc ionainn in ainneoin ár gcuid iarrachtaí an mhaith a dhéanamh. Is mór an sólás a thuiscint go bhfuil maiteanas i ndán dúinn má dhéanaimid aithrí. Uaireanta is féidir linn tamall fada a chaitheamh ag déanamh na maithe agus ansin gan choinne déanaimid an t-olc dár lomainneoin. Caillimid misneach agus imíonn an gliondar as an saol. Is ceart dúinn an aithrí a dhéanamh láithreach, rún leasaithe a bheith againn agus bogadh ar aghaidh go dóchasach. Níl teorainn le trócaire Dé. Ná bíodh teorainn lenár dtrócaire féin ach a oiread. Is iad na daoine is gaire dúinn is minicí a ghortaímid – ár n-athair, ár máthair, ár ndeartháir, ár ndeirfiúr, ár mac, ár n-iníon. Labhraímid leo agus caithimid leo ar bhealaí nach labhróimis agus nach gcaithfimis le daoine eile. An chúirtéis agus an cúram a chleacht muid le linn laethanta na cúirtéireachta, an gliondar agus an grá a d’airigh muid nuair a rugadh mac nó iníon dúinn, an t-ómós a bhí againn dár dtuismitheoirí nuair a bhí muid óg, cá ndeachaigh na rudaí sin uile? Is ceart dúinn iad a aimsiú an athuair agus a chothú arís gach uile lá dár saol. Is minic a chuireas iompar daoine múisiam orm: daoine nach ngabhann buíochas liom; daoine a labhraíos go borb liom. Go fiú daoine a bheith mífhoighneach liom, cuireann sé as dom. Daoine a labhraíos go míchuibhiúil liom, is mór a ghoilleas sé orm. Má bhaineann daoine úsáid asam nó má fhéachann siad le buntáiste a bhreith orm, cuireann sé soir mé. Má dhéanann daoine éagóir orm is deacair liom a míghníomh a mhaitheamh dóibh. Ach nuair a chuimhním air nach bhfuil beart dá shuaraí acu sin nach ndearna mé féin agus gur suarach iad le hais ar fhulaing Críost, maithim dóibh ansin. An duine cruthaitheach thusa? Ar chruthaigh tú úrscéal, litir bhuíochais, dráma, cairdeas, péintéireacht, cáca, dealbh, béile blasta, garraí slachtmhar, geansaí, teaghlach grámhar riamh? Is í an tuismitheoireacht an obair chruthaitheach is iontaí uile. Is furasta a thuiscint go bhfuil muid i bpáirt le Dia in obair na cruthaitheachta nuair a ghinimid beatha nua. Braithimid go bhfuil muid i mbun míorúilte agus go bhfuil mianach diaga ionainn. Cuimhnímis air gur cruthaíodh muid féin i gcosúlacht Dé agus dá réir sin go bhfuil mianach diaga ionainn go cinnte. Tóir ar an áilleacht, ar an ngrá agus ar an bhfírinne is ea an obair chruthaitheach – tóraíocht Dé! Ní furasta maireachtáil de réir an Chreidimh agus de réir theagasc na hEaglaise. Deir cultúr saolta na linne gur ceart an fhulaint agus an íobairt a sheachaint agus a chur ar ceal. Deir an Creideamh Críostaí linn gur as fulaint agus íobairt Chríost a slánaíodh an cine daonna. Deir cultúr saolta na linne nach miste stór a chruinniú ach deir an Creideamh Críostaí linn a bhfuil againn a thabhairt uainn. Deir cultúr saolta na linne gur ceart ár mianta a shásamh ach deir an Creideamh Críostaí gur cóir ár mianta a choinneáil faoi smacht. Nuair a ghéillim don Chreideamh bím sona ach nuair a ghéillim don chultúr saolta bím go dona. Is deacair an t-olc a sheachaint agus ní furasta an mhaith a dhéanmh. Uaireanta bíonn fonn ort rud éigin a dhéanamh ar dóigh leat gur rud fiúntach é a rachfaidh chun tairbhe duit féin agus do dhaoine eile. Éiríonn tú an-tógtha leis an smaoineamh agus déanann tú go leor smaoinimh ar an rud agus ar na bealaí ab fhearr lena chur i gcríoch. Ansin tosaíonn fríd an amhrais ag fás ionat. B’fhéidir nach rud maith é seo ar chor ar bith. B’fhéidir gur mó an dochar a dhéanfaidh sé duit ná a mhalairt. Iarr cúnamh ar Dhia agus ar Chomaoin na Naomh agus dean é ar aon nós! Is iomaí focal atá againn sa nGaeilge ar theach Dé: Tá domhnach agus cill ón Laidin ar phéire de na cinn is sine. Is ón Laidin freisin a tháinig séipéal agus eaglais chugainn. Aisteach go leor bhí an chiall seo leis an bhfocal teach i bhfad ó shin. Maireann an t-ainm i roinnt canúintí sa leagan teach an phobail. Nach álainn an t-ainm é? An féidir linne a rá go fírinneach gurb é an séipéal áitiúil teach an phobail seo againne? An dtugaimid cuairt air go féiltiúil? Babhta sa lá? Babhta sa tseachtain féin? An ann a bhuaileas muid leis na gaolta is na cairde is dlúithe dá bhfuil againn, ár nAthair síoraí féin ina measc? Bíonn laethanta ann ar cuma céard a dhéanfas tú ní éireoidh leat. Beidh tú ag ceapadh go bhfuil gar á dhéanamh do dhuine éigin agat agus gheobhaidh tú amach gurbh amhlaidh a chuir tú olc air. Féachfaidh tú le seirbhís éigin a thabhairt do do chomharsa nó do strainséir agus ní hamháin nach mbeifear buíoch díot ach bainfear míchiall as an iarracht. Ansin nuair a bheas tú go dona ceart agus tú ag iarraidh trua tiocfaidh duine éigin chugat le scéal fada ar an anró agus é ag iarraidh trua ort féin agus ag súil go n-oibreoidh tusa draíocht éigin lena chás féin a leigheas. Níl blas ar bith is féidir a dhéanamh ach an scéal uile a fhágáil faoi Dhia. Tá bearna mhór mhillteach idir an saol a chaithim agus an saol a shantaím, a Dhia. Is mian liom grá a thabhairt duitse agus do mo chomharsana ach is minic gurb é a ghlanmhalairt a chleachtaim. Bím borb leo siúd is gaire dom sa saol: mo bhean is mo chlann. Tagann cúraimí an tsaoil sa mullach orm agus bíonn olc agam dóibh siúd ar chóir dom tuiscint a léiriú dóibh. Féachaim leis an maith a dhéanamh agus an t-olc a sheachaint ach ina ainneoin sin titim i bpeaca seacht mbabhta seachtód faoi sheacht gcéad sa ló. Dia dá réiteach! Sa Teampall ársa ag éirí lán. A aislingí, imígí, tá an lá ag glaoch. In áit na fulaingthe daonna is an léin. Agus súil againn go maithe sé ár bpeaca leamh. Maith ár gcionta is fan ar cuairt. Is mór an phribhléid freastal ar an ollscoil. Más ard féin na táillí clárúcháin, níl iontu ach cuid an bheagáin den chostas a thiteas ar cháiníocóirí an stáit. Is mór an phribhléid a bheith ag múineadh san ollscoil freisin ar ndóigh. Téann dualgas le pribhléid. Déanaimis ár míle dícheall an tairbhe is fearr a bhaint as an bpribhléid atá againn agus an comhar a íoc le pobal na tíre trí mheán na seirbhíse. Tugaimis an tseirbhís sin in ainm Dé. Leanaimis orainn ag saothrú an léinn i gcaitheamh an tsaoil. Déanaimis seirbhís do dhaoine eile agus tugaimis onóir do Dhia. Níl duine ar bith againn nach mbíonn tinn ó am go ham. Is deacair glacadh le tinneas, le pian, le fulaingt. Comhartha is ea tinneas nach bhfuil an cholainn nó an mheabhair ar fónamh. Aláram é nach miste aird a thabhairt air. Ní i gcónaí is léir dúinne ná do dhaoine eile nuair a bhíos tinneas anama orainn. Má bhraithimid a leithéid de thinneas orainn, is fearr dúinn féachaint lena leigheas. Tig linn guí chun Dé, tig linn cúnamh a iarraidh ar oide spioradálta agus tig linn gníomhartha freagracha leorghnímh agus carthanais a dhéanamh. B’eol do na Gaeil riamh gur fearr an tsláinte ná na táinte. Is fearr go deimhin agus is fearr an tsláinte anama ná an saol. Is minic mé ag smaoineamh orm féin. Ní hin le rá nach cás liom daoine eile ach i gcónaí as a dheireadh triallann mo chuid smaointe orm féin. Bím míchompordach amanna nuair a bhraithim go bhfuil an iomarca smaoinimh á déanamh agam orm féin agus go mb’fhéidir go bhfuil faillí á déanamh agam i ndaoine eile. Tuigtear dom nach miste dom breathnú amach dom féin agus do dhaoine eile san am céanna. Tuigtear dom nach miste mé féin a chur chun tosaigh scaití agus mo dhuine muinteartha, mo chomharsa nó an strainséir féin a chur chun tosaigh scaití eile. Ar scáth a chéile a mhaireas muid. Chuaigh Jeff Grabosky, 27, i mbun sármharatón aonair 3,700 míle a thosaigh sé Dé Céadaoin 20 Eanáir 2011 in Oceanside, California agus a chríochnaigh i gCathair Nua-Eabhrac ar an 26ú lá de Bhealtaine 2011. Ba é príomhaidhm an reatha seo daoine ar fud Mheiriceá agus ar fud an domhain a spreagadh chun guí. Ghlacann sé le hachainíocha agus ghuígh sé deichniúr den phadirín ar son gach achainígh. Is cosúil gur ghnách le máthair Grabosky ‘an Paidrín’ a rá le linn di féin a bheith ag rith agus eisean óg agus gur uaithise a thóg sé an sampla. Céard tá mise a dhéanamh ar son Dé agus cén sampla atá mé a thabhairt? Ní miste an Creideamh a chur san áireamh nuair a bhímid ag déileáil leis an saol poiblí. Is iomaí bealach ar féidir linn é sin a dhéanamh. Is ceart dúinn a bheith sásta ár gCreideamh a admháil agus a chosaint nuair a dhéantar ionsaí air. Níor cheart toil a thabhairt do bheart nó do reachtaíocht ar bith a dhéanfadh dochar don Chreideamh. Níor mhiste ugach agus tacaíocht a thabhairt dóibh siúd sa saol poiblí ar léir ar a n-iompar agus ar a ndeir siad gur mór acu an Creideamh. Is rud luachmhar vóta agus níor chóir a chaitheamh ar son duine nó daoine a dhéanfadh neamhshuim nó beag is fiú den Chreideamh. Caith vóta ar son Dé! Is iomaí bealach le daoine a mheas. Beimid ag iarraidh iarrthóirí ar shuíocháin Dála a mheas agus a chur i gcomórtas le chéile go luath. Cén chaoi a ndéanfaimid é? Na slata tomhais céanna a fhónas dúinn sa saol leathúil agus muid ag iarraidh breithiúnas a thabhairt orthu siúd a chastar orainn, b’fhiú dúinn iad sin a chur ag obair. An lucht síochána iad? An bhfuil grá ach do Dhia? An dtugann siad grá dá gcomharsa? Má ea, má tá, agus má thugann, ní miste vóta a thabhairt dóibh. Beidh rath ar pholasaithe a bhunaítear ar iompar síochánta grámhar. Caith vóta ar son Dé! Santaímid an naofacht. Déanaimid obair charthanach. Déanaimid troscadh. Caithimid am go leor ag guí. Féachaimid le grá a thabhairt do Dhia agus do dhaoine eile. Taithímid an séipéal go minic. Agus tar a éis sin is uile, titimid! Ní dhéanaimid an rud is mian linn agus an rud nach mian linn is é a dhéanas muid. Dia dá réiteach! Is minic an nath sin ar ár dteanga agus go deimhin is é Dia a réiteos dúinn gach uile dheacracht. Caithfimid cúnamh a iarraidh air agus caithfimid a bheith foighneach. Tá Dia láidir agus tá máthair mhaith aige! Seans tosú as an nua is ea an Carghas. Seans cuimhneamh ar na bunrudaí. Seans cuimhneamh ar Dhia. Seans cuimhneamh ort féin. Seans cuimhneamh ar dhaoine eile. Seans cuimhneamh ar a bhfuil i ndán duitse agus dóibhsean. Seans guí. Seans ómós a thabhairt do Dhia. Seans buíochas a ghlacadh leis. Seans achainí a dhéanamh air. Seans éirí as drochnósanna. Seans éirí as nithe taitneamhacha ar mhaithe le pionós a chur ort féin ar mhaithe le d’anam. Seans a bheith grádiaúil. Seans cúnamh a thabhairt do dhaoine eile. Seans comhghuaillíocht a thaispeáint leis an lag, leis an mbocht, leis an nocht. Seans réiteach a dhéanamh i gcomhair na Seachtaine Móire. Seans fáilte a chur roimh Chríost Aiséirithe. Seans eile. Seansáil é ar son Dé. Cén t-údar go dtiteann ualach ar dhaoine nach féidir leo a iompar? Airímid ar fad ó am go ham nach féidir linn leanacht ar aghaidh ag iompar ualaí an tsaoil. B’aoibhinn linn faoiseamh. Airímid lag. Braithimid nach bhfuil téagar ar bith inár gcuid iarrachtaí. Bíonn fonn orainn tabhairt suas agus éirí as pé ar bith iarracht a bhíos ar bun againn agus dearmad a dhéanamh ar an saol mór. Sin mar a bhí ag Íosa Críost nuair a d’iarr sé ar a Athair an íobairt a bhí roimhe a thógáil de. Cuirimis ár dtoil le toil Dé agus éireoidh linn – le cúnamh Dé! 1 A anam féin ar ghualainn gach duine. 2 Aithrí thoirní is thintrí. 3 An obair a dhéantar ar an Domhnach bíonn dhá locht uirthi. 4 An timpeall chuig an teampall, is an cóngar chuig an Aifreann. 5 Bíodh Dia ar do bhéal go dtite néal ort. 6 Bíonn uair na hachainí ann. 7 De réir do bheatha is ea a bheas do bhás. 8 Is fearr urnaí gearr ná fada. 9 Ná déan tada in aghaidh Dé, do choinsiais, ná na fírinne. 10 Ní ar scáth a chéile a théas na daoine go Flaithis. 11 Níl amadán is mó ná an peacach. 12 Ní raibh creachadóir i dtír ba mheasa ná an Bíobla. 13 Scairt aithrí is scairt peaca. Céárd is ceart a dhéanamh? Is míchompordach an rud duine a bheith ag gabháil in aois agus an bharúil aige go ndeachaigh sé amú sa saol agus nach é a rud a rinne sé an rud ba chóir dó a dhéanamh. Is measa ná sin go n-aireodh an duine sin nach bhfuil a fhios aige fós céard ba chóir dó a dhéanamh. B’fhéidir nach bhfuil ann i ndeireadh báire ach cleachtadh saoil agus gur fearr do dhuine glacadh leis nach féidir an t-am atá caite a thabhairt ar ais ach gur féidir i gcónaí féachaint le toil Dé a aimsiú agus a dhéanamh san am i láthair agus san am le teacht. Séipéal Eoin Baiste, Séipéal Antaine agus Séipéal Ghaibriéil na trí shéipéal sa gceantar seo againne. Ba cheart go mbeadh ómós ar leith againn do na naoimh a bhfuil siad ainmnithe ina ndiaidh: Eoin Baiste, Antaine agus Gaibriéil. Ainmneacha bíobalta péire acu (Eoin Baiste agus Gaibriéil). Is é an Bíobla scríbhinn bhunúsach an Chreidimh seo againne agus níor mhiste dúinn a bheith de shíor á léamh. Is duine de phearsana móra an Chreidimh Chaitlicigh Antaine agus is minic daoine ag achainí air agus iad i bponc. Ní miste sin. Ná déanaimis dearmad ar Bhríd banphatrún na hÉireann ar ina diaidh a ainmnítear Séipéal Bhríde i gCill Easra ná ar an té a bhunaigh Cill (‘séipéal’) Easra. Céard iad tréithe na naomh? An chéad rud atá acu: creideamh i nDia. An dara rud atá acu: grá do Dhia, do dhaoine eile agus dóibh féin. An tríú rud atá acu: umhlaíocht. Admhaíonn siad a gcuid peacaí, féachann lena seachaint agus féachann lena mbeatha a fheabhsú. An ceathrú rud atá acu: buanseasmhacht. Is cuma céard deir an saol mór, cuireann siad Dia sa gcéad áit. An cúigiú rud atá acu: misneach. Tugann siad dúshlán an tsaoil. An séú rud atá acu: fís. Is mian leo comaoin na naomh a chur ar fáil. An seachtú rud atá acu: mianach fáidh. Is éard é cathú meabhrú ar ár laige. Tagann cathú aniar aduaidh orainn. Cuirim i gcás, an fear atá ag déanamh a dhícheall aire a thabhairt dá bhean agus dá chlann, agus go dtarlaíonn gan choinne go gcuirtear é sa gcruth go bhféadfadh sé a bheith mídhílis dá bhean nó go bhféadfadh sé rud éigin a dhéanamh a náireodh a chuid gasúr. Níor iarr sé a bheith sa gcruth seo ach tharla sé. Níl aige ach dhá rogha cur suas den chathú nó géilleadh dó. Má ghéilleann sé beidh caitheamh ina dhiaidh aige. Má chuireann sé suas de beidh áthas air. Ná géilltear don chathú! Bhí freagracht throm ar Osama bin Laden as easaontas agus gráin a chothú i measc pobal,agus as bás daoine gan áireamh agus as reiligiúin a mhí-úsáid chun na críche sin. Ní dhéanann Críostaí údar ceiliúrtha de bhás duine riamh, ach díríonn ar fhreagrachtaí troma an duine os comhair Dé agus os comhair daoine agus oibríonn le súil gur ócáid gach uile imeacht le haghaidh fás na síochána agus ní hea fás na gráine. ‘Tá an saol an-ghearr’, deireadh sé. ‘Ná déan drochbheart ar dhuine ar bith ach más féidir leat dea-bheart a dhéanamh, dean é’, deireadh sé go minic. Ba dhuine barrúil é a chuireadh ag gáire mé. B’amhránaí iontach é agus ba scéalaí iontach é. Ba dhamhsóir den chéad scoth é agus ba cheoltóir fidile agus coirdín ar fónamh é. Togha garraíodóra a bhí ann agus tiománaí den chéad scoth. Ba chócaire agus ba bhácaeir den togha é. An-chomharsa a bhí ann. Chaith sé a shaol ag déanamh seirbhíse dá chlann agus dá chomharsana. Théadh sé chuig dhá Aifeann agus deireadh sé trí phaidrín gach uile lá. Siod dán acrastach a cumadh le fáilte a chur roimh an mBanríon Eilís II go hÉirinn.Ní miste cuimhneamh air gurb í Eilís II Ceann Eaglais Shasana. Insímis don domhan mór faoi fheabhas a bhéile. Seasaimís gualainn ar ghualainn le chéile. Union Jacks replaced by unions of hearts and labours. Now is the time to share our Easter mission. Piarbhrú is cionsiocair go minic le daoine óga a ghabháil ar bhealach a n-aimhleasa. Níl amhras ar bith ach gur mór a théas cairde agus lucht aitheantais i gcion ar a chéile. Arbh fhéidir an brú piarghrúpa a chur ag fónamh don Chreideamh? Is minic muid ag cású laghad na ndaoine óga a fhreastalaíos ar an Aifreann agus ar imeachtaí liotúirgeacha eile. Na daoine óga dílse a fhreastalaíos, nár cheart iad a spreagadh le brú a chur ar a gcairde agus a lucht aitheantais freastal ar an Aifreann agus ar imeachtaí liotúirgeacha eile? Déanaimis misinéirí na hóige de na daoine óga féin. Céard a chiallaíos an aithne seo? Ní hionann grá agus cion. Níl aon oibleagáid ort taitneamh a thabhairt do do chomharsa. Is leor go mbeadh tú ar mhaithe leis, gurb é a leas a d’iarrfá agus nach ea a aimhleas. Ar ndóigh tá sé réidh go leor an aithne seo a chomhlíonadh nuair a thaitníos an chomarsa leat. Ach is scéal eile é nuair is duine míthaitneamhach do chomharsa (a rinne éagóir ort féin nó ar dhuine éigin a bhfuil tú mór leis). Céard is ceart a dhéanamh? Is ceart guí ar son do chomharsan, go háirithe nuair a dhéanas sé éagóir ort. Aithne dheacair gan amhras. Dé Domhnaigh, 21 Márta 2010 a foilsíodh an chéad mhír Ghaeilge i Nuachtlitir an Pharóiste. Tá sé thar am athmheasúnú a dhéanamh ar an mír. Is ar éigean a fuarthas aischothú ar bith riamh i dtaobh na míre céanna. Ní heolas don údar an bhfuil pobal léitheoirí dílis, mór nó beag aige. Ní mó ná sin atá a fhios aige an soláthraíonn an mhír lón spioradálta do na paróisteánaigh sin a bhfuil Gaeilge acu. Má tá tuairim ar bith agatsa i dtaobh na míre Gaeilge, cuir teachtaireacht ríomhphoist chugainn (sjtbclontarf@eircom.net) nó glaoigh orainn (01 8334606) nó fág nóta sa Sacraistí nó labhair le duine de bhaill an Choiste Thréadaigh. Dia go deo leat! Is minic muid ag déanamh cáis faoina laghad daoine a théas le sagartacht. Is fíor nach bhfuil a oiread daoine ag gabháil leis an tsagartacht agus a théadh anuas go dtí deireadh na seascaidí. Mar sin féin, tá tuiscint nua againne, Caitlicigh, ar an tsagartacht ón Dara Comhairle Vatacánach. Is é sin go bhfuil a leithéid de rud ann agus sagartacht na dtuataí. Tá gnáthdhaoine go leor sásta glacadh lena bhfreagracht mar Chríostaithe cúraimí a tharraingt orthu féin a shamhlaítí leis an sagart tamall den saol: ministreacht an fhocail, ministreacht na hEocairiste, obair thréadach ar bhonn an pharóiste i measc rudaí eile. Bímis buíoch as ucht na sagart tuata! Síolraíonn Eoin na Gaeilge, agus John an Bhéarla, Johannes na Laidine, agus Iōannēs na Gréigise, ón ainm Eabhraise Johanan a chiallaíos ‘tá Dia trócaireach grástúil.’Is leaganacha eile den ainm céanna Seán agus Iain. (Sin é an fáth go dtugaimid Naomh Eoin agus San Seán ar an duine a scríobh Soiscéal Eoin.) Ar ndóigh ba é Eoin Baiste a thuar teacht Íosa Críost agus a d’impigh ar dhaoine aithrí a dhéanamh. Ba chol seisear d’Íosa é. Dhúnmharaigh Héaród Antapas Eoin Baiste ar iarratas Shalómae iníon a mhná Héaróidias as ucht nár thaitin cáineadh Eoin Baiste ar a caidreamh sise le Héaród léi. Dhúnmharaigh Héaród Séamas deartháir Eoin freisin. Tá fulaingt ag roinnt le fógairt an bhaiste agus le dílseacht don bhaisteadh. Cuimhnímis ar Eoin Baiste agus ar dhaoine a meabhraíonn a n-ainm dúinn go bhfuil Dia trócaireach grástúil. Fulaingímis agus fanaimis dílis. Is ionann ‘An Paidrín (Páirteach)’ agus ‘An Choróin Mhuire’ sa lá inniu. 1 Ár nAthair amháin, 10 Is é do Bheatha, a Mhuire, agus 1 Glóir don Athair amháin – deirtear an méid sin cúig huaire agus cuimhnítear ar rúndiamhra an Chreidimh lena linn. Dé Luain agus Dé Sathairn a deirtear na Rúndiamhra Sólásacha: Teachtaireacht an Aingil, An Fiosrú, Breith ár dTiarna Íosa Críost, Toirbhirt an Linbh Íosa sa Teampall, Fáil an Linbh Íosa sa Teampall. Dé Máirt agus Dé hAoine a deirtear na Rúndiamhra Dólásacha: Allas Fola, Sciúrsáil Íosa, An Choróin Spíona, Iompar na Croise, An Céasadh. Dé Céadaoin agus Dé Domhnaigh a deirtear na Rúndiamhra Glórmhara: Aiséirí Chríost ó mhairbh, Deascabháil ár dTiarna, Tuirlingt an Spioraid Naomh, Deastógáil na Maighidne Beannaithe, Corónú na Maighdine Muire ar Neamh. Déardaoin a deirtear na Rúndiamhra Geala: Baisteadh Íosa in Abhainn na hIordáine, An Bhainis i gCána, Fógairt Theacht na Ríochta, an tAthrú Gné, Bunú na hEocairiste. Ar feadh mile bliain is sailm a deirtí leis ‘An bPaidrín (Páirteach)’. Sa dara haois déag nó mar sin is ea a tháinig ‘An Choróin Mhuire’ chun cinn. Ár nAthair atá ar neamh, go naomhtar d’ainm, go dtaga do ríocht, go ndéantar do thoil ar an talamh mar a dhéantar ar neamh. Is amhlaidh atá briathra na dara coda den phaidir sa Modh Ordaitheach. Ár n-arán laethúil, tabhair dúinn innu agus maith dúinn ár bhfiacha mar a mhaithimid dár bhféichiúna féin, ná lig sinn i gcathú ach saor sinn ón mbás. Áiméan.